*Students, creatively engaging your community can win $10,000 for your school and $2,500 PD Grant for the teacher who ‘coaches’ you along the way. Every week, every household in your community is collectively and often fairly unconsciously, making thousands of choices. Each of those choices has many unforeseen impacts; one vital impact of many of those choices, sees more Australians’ futures in manufacturing and farming dumped offshore, while trashing our environment and adding to our ‘landfill’ crisis in the process. 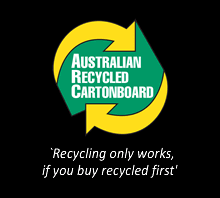 We must ensure we all buy those products using produce grown by Australian farmers, manufactured by Australians, and packaged using Australian recycled waste identified by either of 2 versions of the Australian Recycled Packaging/Cartonboard logo below. Buying recycled is a decision we all need to make – manufacturers and retailers as well; and we need to challenge those who don’t! As consumers, we need to buy grocery products using recycled packaging, as well as household and leisure products made from the materials we recycle. Engage with your community leaders and the media to get even more attention for our messages. Present your entry in a hard copy (printed) form, or as a MS Word document file, pdf, or j-peg on a CD, together with any media (newspaper, TV or radio) coverage received. Each entry may use more than one poster design – you may employ a poster series or a group of posters with integrated messages. Your Campaign needs to impact us where and when each of those decisions is being made – find interesting ways to depict the behaviors we all need to adopt. The ‘buy recycled first’ message has to be as strong as the ‘recycle’ message. Keep in mind, more than anything, we need to get industry to do things differently; to get them to do more of the good things; to use the waste we recycle; to recycle the water they use; and to use less energy. Highlight the individual products, their brands and manufacturers and retailers, that are ‘making a difference’, and those who aren’t! The ARC National Schools Competition has been the central activity of the ARC recycled cartonboard packaging campaign since it started its life in 1994. At that time, cartonboard was the only primary grocery packaging that was made largely from recycled waste. The success of Australian school children in making a difference is proven by industry now also using aluminum (61%) PET (25%) and glass (41%) packaging. Changing to Australian recycled packaging also takes away the market for High Conservation Value Forests, the habitat of such endangered species as the Sumatran Tiger.